Happy Thanksgiving! You can download hundreds of Thanksgiving printables from my many FreePrintable.net websites. You’ll find gift tags, coloring pages, games, and lots more. For smoother gettogethers and events, check out the grocery lists, recipe cards, and meal planners. 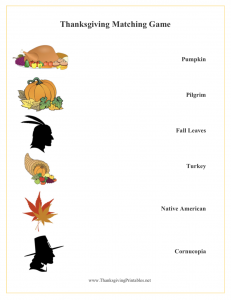 The Thanksgiving printables at ThanksgivingPrintables.net and FreePrintableColoringPages.net feature turkeys, acorns, pumpkins, fall leaves, pilgrims, cornucopias, food, and other iconic images. The games, coloring pages and worksheets are great for school and day care. Or, set out activities at the “kids’ table” to keep young guests entertained. The Thanksgiving letterhead at FreeLetterheadTemplates.net and FreePrintableStationery.net can be used as stationery or for party signs, flyers, and Thanksgiving dinner menus. PrintableFlyerTemplates.net and PageBorders.net haver Thanksgiving borders and flyers to instantly download and print. Find a variety of shopping lists and menu planners at FreePrintableGroceryList.com. Use these free printables for holiday dinners, potlucks, and parties for Thanksgiving, Hanukkah, and Christmas. FreePrintableGiftTags.net has Thanksgiving gift tags with colorful graphics of pilgrims and cornucopias. The tags can be attached to gifts, plates of treats, or potluck dishes. The Thanksgiving recipe cards at FreePrintableRecipeCards.net are free as PDFs or $7 for a DOC (Microsoft Word) version that can be typed into before printing. Illustrated Thanksgiving certificates are at FreePrintableCertificates.net (free for a PDF; $5 for an editable DOC file). There’s even a Thanksgiving fax cover sheet at FreeFaxCoverSheets.net. Several holiday-themed family trees with turkeys, plus everyday family trees, are available at FamilyTreeTemplates.net (free as a PDF; $4 for an editable version). There’s a free version of every single printable at the FreePrintable.net sites, on Thanksgiving or any day.